They are LAZYBONES,#2530 and "A GOOD READ",#2529. Bengal Tiger -JBNW1. John Beswick. The John Beswick collection represents the worlds finest tradition for ceramic animal sculptures. Every piece is hand painted to reflect the natural glory. The magnificent Bengal Tiger is a solitary animal, strong and confident in the natural world. TRUST US WITH YOUR COLLECTION. Marked on base 1185 Beswick England. 26cm tall, weight 879 grams. Swan head and neck handles and open winged design centrally. "Mrs. Ribby". Beatrix Potter's. I am no expert, and try to describe things to the best of my ability. However I may unintentionally leave out details that may be important to you, not realizing that they are of importance. 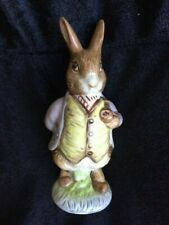 Vintage Beswick England Beatrix Potter “Mr. Benjamin Bunny” Figurine BP-3c MINT! He is 4-1/2" long and in perfect condition. No issues at all. It has little felt feet on the bottom which is non factory. It is "The Old Woman who lived in a Shoe". The old woman in this case is a cute little mouse. Her babies crawl all around her in the blue high heel shoe. The bottom mark is the early, and more desirable "oval" Beswick mark. John Beswick. The John Beswick collection represents the worlds finest tradition for ceramic animal sculptures. Every piece is hand painted to reflect the natural glory. This hand crafted study shows a striking orange bill and crisp white plumage. Basestamp: BP9b. Beswick Beatrix Potter Tom Kitten (Gold Buttons). Beatrix Potter Beswick Tom Kitten in the Rockery BP10A. Consists of. John Beswick. The John Beswick collection represents the worlds finest tradition for ceramic animal sculptures. Every piece is hand painted to reflect the natural glory. The perfect addition to any dog lovers collection, this hand crafted Schnauzer study features the distinctive bearded snout and feathery eyebrows of this German breed. Labrador(Black)-JBD99. John Beswick. The John Beswick collection represents the worlds finest tradition for ceramic animal sculptures. Every piece is hand painted to reflect the natural glory. The Labrador is the most popular of all pedigree breeds. PERFECT CONDITION & GREAT COLOR NO WEAR. We will invoice you. We do not keep you waiting hours on end for a reply. It's that easy. SUGAR OF WENDOVER. BESWICK GERMAN SHEPHERD. 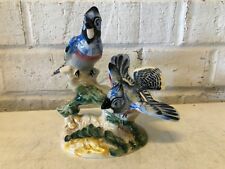 SIGNED: BESWICK ENGLAND. Beswick does a fantastic job giving each piece their own personality. BEAUTIFUL REALISTIC DETAIL & COLORING! and may show signs of normal wear and age. New listingLarge Beswick Elephant Approx 14.5" long and stands approx 10" tall. Approx 14.5" long and stands approx 10" tall. In good condition with one small chip to the right ear and the left tusk has been broken off and stuck back on. Snow Leopard -JBNW5. John Beswick. The John Beswick collection represents the worlds finest tradition for ceramic animal sculptures. Every piece is hand painted to reflect the natural glory. A unique animal that that thrives alone in the cold high mountains. Mint condition. 2 3/4" x 4". Beswick model number 2196, designed by Albert Hallam. We will invoice you. John Beswick. The John Beswick collection represents the worlds finest tradition for ceramic animal sculptures. Every piece is hand painted to reflect the natural glory. Wildlife Collection. Fox Sitting-JBW14. Beswick model number 2214, designed by Albert Hallam. We will invoice you. Also includes a little Tales Of Peter Rabbit book. She is mint in the original tin. Beswick sheldrake duck - mold #995. This beautiful duck is either landing or taking off into flight. Features natural shades of green & brown. Oval, brown Beswick mark on base. Condition is very good but one small chip on wing edge. "Hunca Munca". Beatrix Potter's. I am no expert, and try to describe things to the best of my ability. However I may unintentionally leave out details that may be important to you, not realizing that they are of importance. THIS IS A BEAUTIFUL URN / VASE MADE BY BESWICK POTTERY ENGLAND. LOVELY SHAPED WHITE POTTERY WITH A GREEN GLAZED INSISE. I’VE BEEN TOLD THE STAMP STYLE IS FROM THE 1920s. BESWICK ENGLAND. Tabitha stands 3 1/2" in height and is made of porcelain. She is fully marked on the bottom, and Dated 1961. "Timmy Willie Sleeping". Beatrix Potter's. I am no expert, and try to describe things to the best of my ability. However I may unintentionally leave out details that may be important to you, not realizing that they are of importance. "Squirrel Nutkin". Beatrix Potter's. I am no expert, and try to describe things to the best of my ability. However I may unintentionally leave out details that may be important to you, not realizing that they are of importance. Vintage Beswick Thoroughbred Stallion Porcelain Gloss Horse 7"
Beatrix Potter 1954 Flopsy Mopsy & Cottontail F Wayne & Co.